"Please report any unattended luggage." Upon my return to SFO, I witnessed this amusing scene. 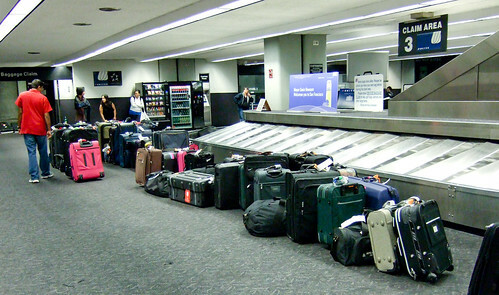 So there were two United flights from LAX to SFO around the same time, and apparently some of the baggage got swapped, so the people on the earlier flight were still waiting for their bags to come in on the later flight, while the bags from the second flight had already arrived, though their owners hadn't. I assume airport handlers took them off of the carousel to clear it off. (My own bags from JFK were supposed to come out of Claim 3 here, but instead they emerged from Claim 2.) Hijinks all around. But the kicker was when I overheard the PA system say, "We are at Homeland Security Alert Level Orange. Please report any unattended luggage to airport personnel immediately. Thank you."